CAF Plans World’s Largest VpCI Film Extrusion Plant Featured in Plastics Packaging Magazine! CE Certification opens EU Market to six Cortec® MCI® Concrete Protection Products Featured in Inside Industry Magazine! Corrosion Inhibiting Coating Featured in Shipping UK Magazine! Cortec® Offers Synergistic Corrosion Inhibiting and Desiccant Action Featured in Construction Magazine! Film Extrusion Plant to be Expanded Featured in Electronic Specifier Magazine! Latest Migratory Inhibitor Technology Featured in Metal News! 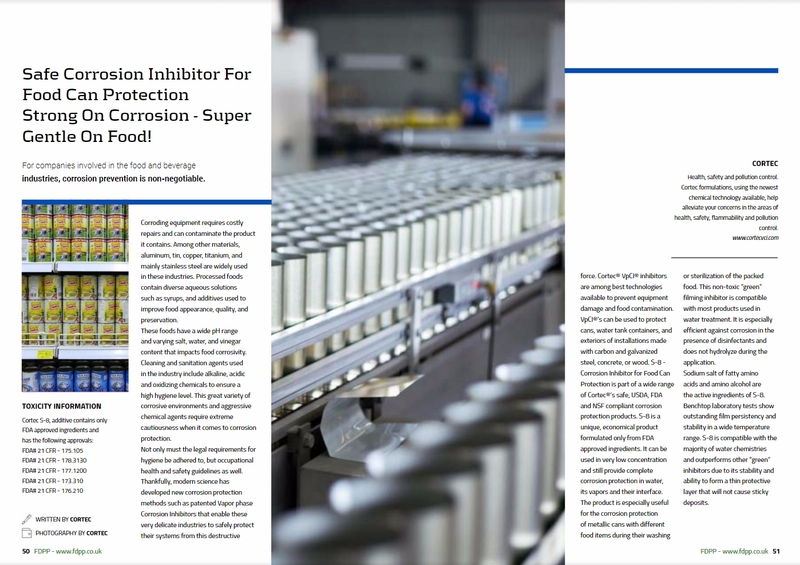 Low Conductivity / Low Sodium Corrosion Inhibitor Featured in Corrosion Managment Magazine! New Product Release – Cortec Corporation Featured in Shipping Magazine! On-Demand Box-Making Machine Expand Capability and Efficiency Featured in Engineering Specifier Magazine! Rust Preventative - Cortec - Facility Management Product Release Featured in Facility Management Magazine! VpCI® Film Extrusion Plant Plans Important Expansion of Facilities and Cutting Edge Recycling Program Featured in Pollution Solutions Magazine! World's Largest VpCI® Film Extrusion Plant Plans Important Expansion of Facilities Featured in Lab Magazine!